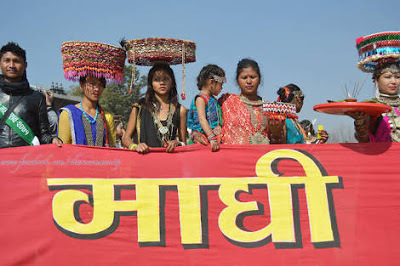 Kanchanpur–The Belauri municipality in Kanchanpur is hosting a cultural festival on the occasion of the Maghi which is observed on the first day of the Nepali month Magh. The Maghi festival this time falls on January 15, 2019. Tharu Welfare Assembly, Belauri town committee is organizing the three-day Maghi festival from coming January 11. First day of the month Magh is largely celebrated the Maghe Sankranti and the Tharu community celebrates it as the Maghi. The objective of the festival to be supported by the Belauri municipality is to promote the Tharu culture. The theme of the festival is "Tharu Ekata Hamar Shan: Siksha, Bhasha and Sanskriti Paurhaiti Laijina Hamar Abhiyan",which means unity among the Tharu people is their pride and prestige and our campaign is for promoting education, language and culture. A blood donation programme has been scheduled in the opening day of the festival which will showcase 15 cultural stalls relating to the Tharu cuisine and attire, festival publicity committee coordinator Krishna Gumba Chaudhary said. It is taking place in the Belauri Open Theatre. A cultural procession reflecting the traditional art and culture of the Tharu community, Maghauta Dance, Mungharawa Dance, Jhumra Dance, Tharu Dance will be presented during the course of the festival. Tharu and non- Tharu artists of national level will be there to give their performance in the festival. Over 10,000 people are expected to visit the fair which is estimated to cost Rs 500 thousand.